Flood and Drain fittings pack. 1080mm x 1080mm x 180mm Deep. Outer dimension (3ftx3ft) Duralastics extra strong table for Hydroponi..
2610mm x 1380mm x 180mm Deep. Outer dimension (4ftx8ft) Duralastics extra strong table for Hydroponi..
770mm x 1380mm x 180mm Deep. Outer dimension (2ftx4ft) Duralastics extra strong table for Hydroponic..
Sure Grow SG 170 NFT channel BASE and LID set 1m length. FOOD GRADE AND UV STABLE!!! SPECIALLY PROFILED FOR GROWING. 170mm wide and 68mm deep. 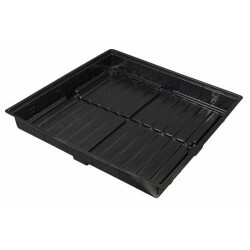 Suitable for m..
Sure Grow SG 170 NFT channel BASE and LID set 2m length. Sure Grow SG 170 NFT channel BASE and LID set 3m length. Sure Grow SG 225 NFT channel BASE and LID set 1m length. FOOD GRADE AND UV STABLE!!! SPECIALLY PROFILED FOR GROWING. SUIT LARGE PLANTS. 225mm wide and 70mm d..
Sure Grow SG 225 NFT channel BASE and LID set 2m length. Sure Grow SG 225 NFT channel BASE and LID set 3m length. Sure Grow SG 50 NFT channel BASE and LID set 1.5m length. FOOD GRADE AND UV STABLE!!! SPECIALLY PROFILED FOR GROWING. 100mm wide and 50mm deep. Suitable for s..
Sure Grow SG 50 NFT channel BASE and LID set 3m length. FOOD GRADE AND UV STABLE!! !..